Have you ladies and gent(s) seen this issue? I know many of you have, since you're the ones who recommended it to me. Damn, this thing is good. It's worth it for the price alone for the article "Memories of a Parisian Seamstress: Tales and techniques from the workrooms of couturier Jacques Fath." The funny thing is, I actually have this article on my Threads DVD that I got for Christmas a few years ago, but somehow never came across it. 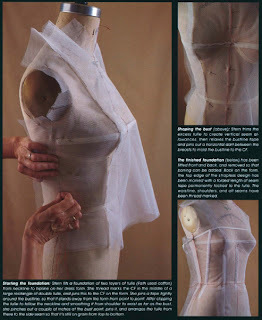 It outlines, step by step, the process that Fath used for draping an evening gown foundation with cotton tulle. (As you might recall, I wrote about this technique a few weeks ago). I can't recommend the article highly enough. It's given me a ton of ideas for how I might utilize this technique on my own. 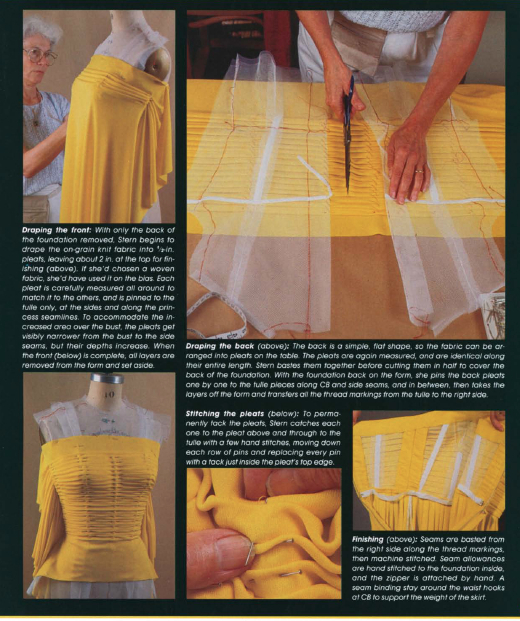 Plus, it gives a bunch of awesome insights into being a seamstress for Fath in the late 40s. It's pretty amazing being able to read a first-hand account of that era. There are also articles on Chanel, Norman Norell, and Yves St. Laurent, among others. Even if you have these on disc, it's pretty cool being able to read them all together, on the subway, for instance. Anyone else obsessing over this issue? P.S. : Love your blog! Keep it up! I had not hear about this. Thanks so much for sharing. I'll have to get a copy. Thanks for the post. It's rare that I buy Threads. There has to be two good articles that I'll want to use to justify the price of it. I use to hear from seamstresses how much more advance it use to be years ago. 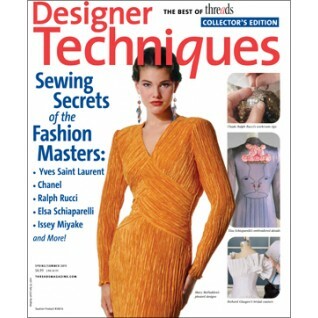 I'm glad to see an issue devoted complete to different types of sewing techniques! I picked up this issue, it's a goodie! I always enjoy reading Threads magazine. I brought this issue last week. I had to make myself put it down in order to finish some tasks I had to complete. Thread's has always been one of my top five sewing resources. Stupid question: Where does one FIND Threads for sale in NYC? I was eying this at JoAnns the other day, but was in a hurry and didn't get a chance to flip through the issue. Think I'll have to certainly pick it up this week though!!! That article looks amazing! I remember when this article originally was printed in Threads; it's brilliant. Suzanne Pierette Stern also put out a video of her draping technique shortly after that article appeared. I bought a copy of it; it is also quite marvellous. That looks great - has it only just been published? I wonder if it will make it to the UK - I hope so! I do remember seeing this article. Do you know the issue number? I need to look at this again. Thanks. I saw this the other day and didn't investigate it, but now I wish I had! I will have to make a trip out to see if I can pick it up. It looks fascinating. I seen this advertised in the normal threads mag, which I buy as an import here in the U.K . and I sooo want to get my hands on a copy of this one, I'm hoping that they'll import it in to the u.k too. I have not seen this issue, but I have to get my hands on it ASAP!!! I don't buy sewing magazines too often, but am considering doing so now that I am blogging about the subject. Can never have too much material when you try to post daily! This is an EXCELLENT issue with lots and lots of designer details and guidance. I picked it up @ JoAnn's last week and read it cover to cover in a couple of hours. It's jam-packed with amazingness! Peter, you can buy it at most Universal News stores and Barnes & Noble. In the garment district, they have it at Paron's and New York Elegant. Unfortunately, I haven't seen the special issues anywhere though, so I just ordered this one online. I have had a subscription to THREADS since issue 6. I am missing a couple of the very early issues because they were out of print, and a couple that were loaned to someone never made it home again. The magazine has changed, but is still the best. I too have been eyeing this magazine every chance I get but have not bought it. I must at some point. So cool you posted it! I drooled over this issue in the grocery store and even hid a copy behind another mag to make sure it was still there on payday. It's totally worth it to buy! I love your blog and would love to get one of this collectors issue of Threads. But I live here in the PHilippines. Would there be any chance I can get hold of this issue? I bought my copy in WHSmith, so it's definitely available in the UK. Fabulous stuff, love the chanel jacket article. Love your post and would love a copy of this amazing looking magazine. I'll have to see if my newsagency can obtain one for me. I bought the magazine for that article alone. I love the rest too! It's very fascinating, I most often visit your blog and kinda learnt a lot from you. You are an awesome seamstress. beyond the words.